At the library, I checked out a book Du Pont by William Dutton. The book had been a gift to the library from the f)u Pont Company. I also checked out a book Alfred I. Du Pont by Joseph Frazier Wall. That book’s author J. Wall was financed to write the book by the trustees of the Jessie Ball du Pont Fund. Although scholarly in appearance, it is what they don’t say that can be so crucial to really understand the history of the du Pont family. When a family is worth billions they can afford to tidy up their family histories, and keep people from spilling the beans about secrets. On May 16, 1893 the press reported the death of Alfred Victor du Pont with great laudatory comments. Alfred (known as Fred) had been in business in Louisville, KT and was widely known in the area as a philanthropist. Louisville’s main paper the Louisville Commercial gave the public a totally fictitious story about how Alfred Victor du Pont died, along with many pages of the highest praise. If it hadn’t been for the honesty of the Enquirer (a Cincinnati paper–not to be confused with today’s national tabloid by the same name Enquirer) the public would not have learned what really had happened. The false story’ said that Fred died of apoplexy while visiting his brother Bidermann. The duPont family still maintains this fiction is true, although all the facts of the case are blatantly known, and were public knowledge to quite a number of people whose lives were involved with what actually happened. Both Fred du Pont and his nephew Coleman du Pont were regular customers at the most expensive house of prostitution in the area, Maggie Payne’s bordello. Although rich, Fred was not willing to help support a distraught prostitute raise the child she was sure he had sired. So she shot Fred in the heart. Coleman du Pont, who was familiar with Maggie’s, soon went down to Maggie’s, retrieved the body with a hearse and took the body to Biderman’s house. There the coroner was willing to lie on the death certificate that the death was caused by ,,effusive apoplexy.’ It is most likely Coleman made that lie worth his effort. Henry Watterson, editor of the Courier-Journal, although he later admitted he knew the real story of the murder, went ahead and printed the false story on behalf of the du Ponts. This article starts out with this anecdote to make a point–the 13 top families do control the press–and are very sensitive to any negative publicity of any kind. Not only are their Satanic activities deeply hidden, but even just the normal everyday sinfulness or human soap box drama of their lives is deeply hidden. By the way, Coleman duPont, an extremely hedonistic man, is one of the duPonts I strongly suspect was into Satanism. Further secrecy has been obtained by working through trusted proxies. Today, a key proxy is the jew Irving Saul Shapiro. The du Pont family is represented in a number of groups by Irving Saul Shapiro, who is on the Council of Foreign Relations. Irving S. Shapiro is a key person who has been the go-between to coordinate the activities of the Rockefellers, the du Ponts, and the Watson families (Watson family members who are 6° Illuminati are mentioned in the 1/1/93 newsletter. Shapiro was a member of Carter’s Advisory Council on Japan-US. Economic Relations, is a trustee of the University of Delaware, director of the Jewish Federation of Delaware, director of IBM (which is a Watson-Rockefeller business), director of Citicorp (Rothschild’s and Rockefellers–headed in the past by 6° Illuminatus, CFR member, Bilderberger Walter Wristen), and the U.S./U.S.S.R. Trade and Economic Council (which Rockefeller plays a big part of). Shapiro is or was director of Continental American Insurance Co., International Business Machines (under IBM). Irving Saul Shapiro was chairman of the du Pont company. The biographies of the du Pont family usually begin with the marriage of Samuel du Pont to Anne Alexandrine Montechanin in 1737 in Paris, France. Although Anne was a Huguenot, she was a medium with the spirit world. Anne came from an ancient noble family that lived in Burgandy, France. It is quite possible that it was Anne’s bloodline that gave the Du ponts their occult power. Anne’s bloodline may possibly tie in to the House of David. At any rate, Samuel and Anne’s son was the first du Pont to rise to greatness, and the first du Pont that can be connected directly to the Illuminati. Samuel and Anne’s son was Pierre Samuel du Pont. Later Pierre Samuel added de Nemours to his name to prevent confusion between him and other French legislatures named Dupont. Pierre Samuel du Pont was a ge nius. Pierre’s mother taught him to be a medium with spirits, but early on Pierre had to deny it publicly. His father Samuel could not understand the boy’s genius, such as his ability at age 12 to translate Greek and Latin at sight. When Pierre’s mother died when he was 16, be no longer had a parent in the family who could understand him, and after getting one of his frequent beatings from his father, he ran away, and was spared near starvation by his Uncle Pierre de Monchantin. Initiatially, Pierre was a watchmaker, But within a short time he attracted the attention of several top Illuminati for his ability to write good tracts, and articles that advocated various economic and political views that they wanted promoted. Pierre Joined the Freemasons, and at some point was illuminized, as most of the French lodges became. Although Pierre went through severe financial difficulties after the French Revolution, be regularly made payments to Masonic organizations in France. Besides being friends with all the famous Masons of the time, one Mason brother of his worthy of note is the French astronomer Lalande, who helped hide him during the revolution. Someone very powerful protected Pierre Samuel during the French Revolution, this is hinted at by historian Pierre Jolly, although Jolly never gives his protector’s name. I believe he was protected because DuPont was part of the Inner Satanic hierarchy. He was also protected by the daughter of Swiss financier Jacques Necker. This daughter was Madame Germalne de Staël. The Madame was a close friend of Pierre Samuel and she operated a famous salon/cathouse. Madame de Staël was nothing less than an intimate friend of St. Simon. She shared his occult revolutionary ideas. Henri de St. Simon was a student and friend of Jacques Rigomer-Bazin who was associated with the Inner circle of several occult-based revolutionary groups during Pierre du Pont’s time in France. St. Simon was the author of The New Christianity which foreshadowed the creation of international communism. He also wrote in the early 1800s The Globe and The Reorganization of the European Community laying out ideas and plans for European unity. In the early 1800’s, the Saint-Simonians suggested in the early 1800’s that the date 2000 be the target date for the New Order. In order to rearrange the world into the New Order, a number of items and stages needed to occur. Two canals-one through the Suez and one through Panama were needed they said to create “Interdependence” between the nations. They also suggested a high dam on the Nile. They suggested the technological transformation of the earth, and the biological creation of a new, androgynous humanoid. (Androgynous beings are being produced in underground facilities-they are the small greys used to fly the saucers!) Progress would be brought about by a series of revolutions. (Study from Fire in The Minds of Men by James H. Billington to understand how the occult fraternities have created all the revolutions since the French revolution.) St. Simon, an Illuminatus, wanted to have a child with Madame de Stall which would become the anti-Christ. It didn’t happen, but anyway, it is significant that the person who personally intervened during the French Revolution and saved Pierre Samuel DuPont’s life was Madame de Staël. Necker along with Lafayette would later loan DuPont large sums of money for him try out his schemes in business and in forming a communist society. It’s interesting that the Physiocrats journal was Les Ephémérides du Citoyen The title has astrological occult undertones. The Duc d’Orleans, Grand Master of the Grand Orient of France, that is head of all the French masons, along with two other key Masons Talleyrand and Mirabeau started the Jacobins. According to the book The War of the Antichrist with the Church (a book made from the lectures of George Dillon) (Dublin, Ireland: M.H. Gill & Son, 1885) where Dillon lectures on the French Revolution he states that both Talleyrand and Mirabeau were key Illuminati. The name of the original lodge of the Jacobins was changed to Club Breton and then Jacobin Club. The Jacobins were basically an illuminized type of Freemasonry. The President of the Jacobin Club was the Freemason Georges Jacques Danton, who was a member of the famous and powerful Nine Sisters Lodge (nine sisters or nine muses is what the Pleiades is called.) Lafayette was a Jacobin, as well as the key players in the French Revolution. A very secret body of 300 key Freemasons ruled France secretly during this period according to the Autobiography of Wolfe Tone (pub. by R. Barry O’Brien, 1893). Robespierre, was both a Freemason and an illuminatus. In fact, he was both a disciple of Weishaupt and Rousseau. Prussian Baron Anacharsis Clootz was also a Freemason and illuminatus. He also was a disciple of Weishaupt and understood better what Weishaupt was trying to accomplish. If one studies what these men taught you will discover it is what was later known as Socialism and communism. The original idea for all the French Revolution started with the Satanic hierarchy. In Nov. 1793, the true colors of this Satanic inspired business can be seen in the campaign against religion, where anyone who was a priest in France was killed, and the Illuminati posted one of Its motto’s in public “Death is an eternal sleep.” Eyewitnesses testify that Satan has a very detailed plan which he entrusts to his very select few at the top. Much of what seems coincidence and unrelated is actually according to a yery clever (diabolical) plan. Eleuthère lrénée Du Pont was a major printer for the Jacobins. He was a convinced Deist and worshipped nature too. The Mason Stephen Girard (1750-1831), initiated into Masonry in 1788 in Charleston, S.C., helped establish the second Bank of United States in 1816 and served as its director. Girard had amassed a $9 million fortune by the time of his death. He was born in France, and become a sea captain. Where his money came from is somewhat of a mystery. He gave large sums of his money to masonic charity. These men had great authority over the tribe of duPonts. The du Ponts had family council where even the women had voting rights. The DuPonts, like the Rothschild’s helped set up their children’s marriages, and many of the early ones were to cousins. For instance, much to the delight of the duPonts, Sophie Madeleine du Pont married her cousin Samuel Prancis DuPont in 1833. (2 of Sophie’s drawing occur later in this article.) The family owned everything in common, and distributed according to needs and according to the contribution that each could give to the family business. The James Bidderman, the son of Evelina DuPont Bidderman, went to France and his decedents would give the DuPonts a lineage in France. 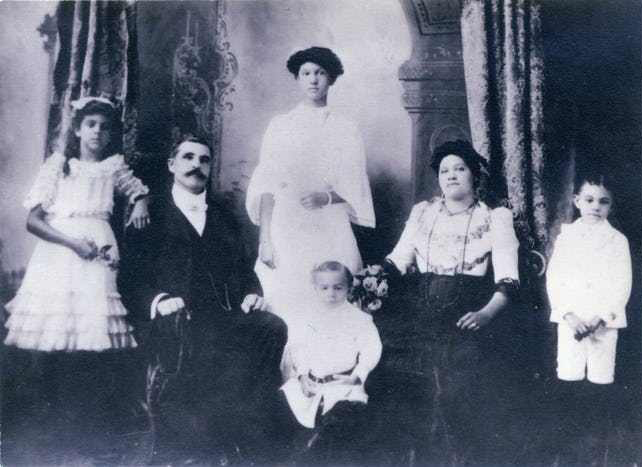 One of the families that Intermarried and were close friends with the DuPonts was the Cazenoves family. Both families were close friends with Thomas Jefferson and Albert Gallatin, I have concluded that both Thomas Jefferson and Albert Gallatin were Illuminati. Further, I discovered in a forty volume set on American Statesmen in vol. 13, p.386 that Albert Gallatin claimed to be descended from the ancient Roman Consul Callatinus. Incredible as it may seem, the black nobility have kept track of their bloodlines. The same people ruling the world today are in many ways the descendants of the rulers in past ages. Antoine Charles Cazenove, born in Geneva, Sw. was a business partner with Albert Gallatin. During the War of 1812, the DuPont gunpowder factory since it was the primary American powder company was the known target for the British to destroy. However, the British never attacked it. The Du Ponts had organized a local militia called the Brandywine Rangers. Interestingly, their militia flag was a beehive on white silk. Lafayette visited the DuPonts in Delaware the summer of 1825. Eleuthère lrénée du Pont had a daughter Sophie Madeleine du Pont (1810-1888). Sophie was also her mothers name. Sophie Madeleine du Pont (her name Sophie/Sophia is popular with Moriah) wrote diaries, journal voluminous correspondence. Sophie also drew hundreds are drawings and sketches, many of them characters of people. Of her sketches, this article reproduces two of them which bear importance to this newsletter. The first is a drawing by Sophie du Pont of one of the duPonts dressed up like Satan with long paper horns and a tail. Interestingly, according to a 12/12/1829 letter by Sophie to one of her relatives Sophie comments that the costume of Satan was mistaken “for Old Nick.” (See the article on Saturn in this newsletter for evidence of the connection between Satan and Santa.) The next drawing is a drawing that went with a letter from Sophie to Clementina Smith, 21 July 1837 which is a self-portrait of what Sophie calls “blackies” (black servants) who “toted” (carried) her to her bath in a special chair. This drawing is included to show how wealthy the DuPonts were within a short time after coming to Delaware, U.S.A. Alfred Victor DuPont, who took over as head of both the family and the factories making gunpowder, was married to Meta. Meta was into Swedenborgianism, which was a type of mystical religious Freemasonry, that was based on the Swedish mason Swedenborg’s teachings. Alfred Victor apparently didn’t feel anything negative toward this. His wife Meta organized a Swedenborg church in town. Around the Civil War times, the DuPonts became less identified with Deism and more Identified with the Episcopal church. Joanna Smith DuPont was Instrumental in this change. One of the families that the DuPonts would marry with was the Cazenoves, who were Episcopalians, and some members were I suspect involved with the Illuminati. Christ Church was built off the DuPont communal property for Episcopal services. By the Civil War, the state of Delaware was lock-stock-and-barrel under the control of the DuPonts and their friends the Bayards, the Saulsburys, and the Greys, in this 20th century, the DuPonts have gotten firmer control. Because the state of Delaware is controlled by the DuPonts, et. al, it is worthwhile to examine some of the people the DuPonts and their elite friends have placed into office. This is a very unfinished skimpy list, I have done only a little research in this direction. T.Coleman duPont ( Sen.1 921-192?) Henry A. DuPont ( Sen.1 895-1896) ( 1906-1916) In 1896, the U.S. Senate rejected his election and therefore Henry duPont’s credentials due to proof of voter fraud. Delaware legislature (republican) replaced Henry (a republican) with a democrat. But in 1899 when the Senate seat became available and another one in 1901 too they could not come to any agreement on a selection of a Senator because Henry A. DuPont and John Edwards O’Sullivan Addicks the two republican leaders were fighting so much. Consequently in 1899 Delaware only had one U.S. Senator and from 1901 to 1903 Delaware had no U.S. Senators. L.H eislerB all ( 190345,1 919-25) also served Del.as state treasurer — Freemason. In 1889, Alfred I. du Pont attempted to bribe French officers in charge of the production of smokeless gunpowder to give the secrets to him. But no amount of bribe would work, as the Frenchmen knew they would lose their lives if they gave the secrets to him. The British were not any more helpful. Ufe was not all peaches and cream. Fred was murdered. William du Pont (1855-1928) was trapped in a marriage with a duPont cousin, May du Pont, that he ditn’t want to be married to. Louis Cazenove du Pout a handsome, intelligent young – committed suicide with a bullet in the library at the Wilmington Club. Alfred was shot in the face by accident on a hunting trip. The duPont family had their share of heartaches, broken marriages, insanity, etc. When Mary Belin married into the family she brought some Jewish blood. As a major part of the budding military industrial complex the DuPonts during the 19th century had to work with the army and navy. The army and navy convinced them to Implement a contract with the Coopal Co. in Belgium for smokeless powder, which when the formula was received was found to be inferior to what the American were already producing. However, this whole episode ended with the DuPonts going with their own formula and setting up a new plant at Carney’s Point, New Jersey. This hits the highlights of the family history in their first 100 years in this nation. To celebrate their first hundred years, every living descendent of the first Pierre Samuel was invited to a great banquet. A building was built to house them. They numbered over 100. At each person’s table setting was a special gift of a gold coin, prepared especially to commemorate this centennial. On Jan. 1, 1900, the DuPont tribe celebrated. The DuPonts are shrouded in so much secrecy, that their secrecy is not even known. When Eugene DuPont, the chief executive of the family gunpowder/high explosive business died near the turn of the century, none of the other DuPonts hardly even a vague idea of how much the company was worth or what assets it had. (At that time the DuPonts had powder plants in PA, DEL, Iowa, and TN. The DuPonts are much the same today, except that their assets are perhaps ten times better hidden, not only from outsiders but from themselves. The DuPonts have in general made their money the hard way-by working and producing, in contrast to the other top families. The DuPonts are to be commended on this, even If at times they have been very tight on what they have given their workers. The DuPonts have also shown an amazing ability to keep their dynasty alive. There seems to be an increasing invisibility to their family. However, as I carried out what promised to be a long term research project on the Society it began to appear that something big was behind this organization. One reference stated, “The Society of the Cincinnati # 1783 # it is likely that no Englishman feels a greater sense of pride in being a Knight of the Garter, or Scotsman, a Knight of the Thistle, than an American feels in being a member of The Society of the Cincinnati.” WOW. DOUBLE WOW! Here is an organization that essentially no one I know has even heard about, and yet an American would feel a great sense of pride in belonging to it. Interesting. Not only that, but I knew what the Order of the Garter is!! The Order of the Garter is the secret inner group which is an elite group within the Order of St. John of Jerusalem which is the British part of the Knights of Malta. The Knights of the Garter are the leaders of the Committee of 300. They are diabolical men. Lord Peter Carrington, who is a member of the satanic Order of Osiris and other demonic groups is a member of the Order of the Garter. Lord Palmerston is an example from history of another similar example of a Knight of the Garter who was totally corrupt, pretended to be a Christian, and practiced Satanism. I found out that the Massachusetts legislature had had some of its senators and representatives concerned for the welfare and safety of the United States, because, according to testimony on record, the Society of Cincinnati was “the beginning of a hereditary aristocracy in the U.S. dedicated to subverting the Republic.” The Massachusetts Legislature declared the Society of the Cincinnati “dangerous.” And yet speaking for the public for all the legislators trouble, the truth is nobody has even heard of the Society of the Cincinnati, let alone known or guessed it was dangerous. When the United States was created it operated under the Articles of Confederation. It was a confederation of Independent states-each of the states printed their – money, passed their own laws, etc. The federal government was simply a League of Nations-type body. The Society of the Cincinnati was partly responsible for getting that changed. The Society of Cincinnati favored a very strong central government, a national bank, etc. The Freemason Baron von Steuben is credited with starting the organization. The Mason Pierre L’Enfant who designed the CIty of Washington with its hidden occult symbols also designed the logo for the Society of the Cincinnati. Every president of the United States has worn the Diamond Eagle jewell of the Society of the Cincinnati. Wow. And I hadn’t even heard about it until I got this tip from this ex-illuminatus. Benjamin Franklin was an honorary member. The Marquis de Lafayette was a member. George Washington and James Monroe were Original Members. At least 15 Presidents have been honorary members. Pres. Franklin Pierce and Zachery Taylor (his father was an Original Member) were hereditary members. Many of the high ranking Masons who were also officers in the Revolution were Original Members. Three prominent Freemasons who were big in the Society of the Cincinnati were Henry Beekman Livingston (1750-1831), James Mann (1759-1832), and Hardy Murfee (1752-1809). Hardy served as Grand Master of the Grand Lodge of North Carolina beginning in 1789. I noticed that many very busy elite People were spending a lot of money and time on this Society, whatever its purpose was. The Society had a museum, and a headquarters building in Washington, D.C. on Massachusetts Ave, N.W., and state chapters. But why? The stated purpose of the organization didn’t seem to explain the interest people put into the organization. Why spend time belonging to an organization whose only purpose is to commemorate the fact that all Its members are descendents of Revolutionary War officers? The purpose of the organization is “To render permanent the cordial affection subsisting among the officers.” O.K. I can understand a group of officers who are all veterans of a war getting together. But their descendents? We are talking about a war whose fighting basically ended in 1781. That’s over 200 years ago. Would my busy descendents care to visit with some other Vietnam vets’ great-great-great grandchildren 200 years from now? Yet, my 1983 World Almanac (which lists in fine print about 1,300 associations) gives the membership of the Society of the Cincinnati at 2,800. Other sources indicated that the organization had an affiliate organization in France. But how? How could an organization which was open to only descendents of select Revolutionary Officers be so Identical in purpose to something in France for frenchmen? I could understand why, but only If the stated purposes were not the whole story. As you can see I was very suspicious of the Society of the Cincinnati, it appears I had stumbled onto something big. But I hadn’t been able to tie the Society in with the Illuminati-until I stepped up my research on the duPonts. The tie-in between the Illuminati and the Society of the Cincinnati came when I began investigating what I thought might turn out to be an obscure Person. His name was Leighton Coleman (1837-19??) and he was married to Francis (Fanny) Elizabeth, daughter of Alexis Irenée du Pont (1816-57). Alexis died in an accident. Occult bloodline power can pass through women or men, so it was worth it to investigate Leighton Coleman. Leighton Coleman turned out to be the Bishop of the State of Delaware for the Episcopal Church. He was a prime mover in the temperance movement (which I had already discovered was Illuminati controlled). Further Leighton was grand chaplain of the Grand Lodge of Freemasons in Pennsylvania, Grand Prelate of the Knights Templar, and chaplain of the Delaware Society of the Cincinnati. Another of the top 13 Illuminati families is the Kennedy family. There is a connection to the Society of the Cincinnati with this family too. Jacqueline Bouvier Kennedy Onassis (ex-wife to both J.F.K. and Aristotie Onassis) had a grandfather named Major Bouvier, who invented a family genealogy which was mostly fiction which was self-published in 1925 as Our Forebears, but tbe fantasy Bouvier genealogy allowed him and his sons Bud and Black Jack to get into The Society of the Cincinnati. (see A Woman Named Jackie, by C. David Heymann, p. 18) All three Bouviers were very proud of their memberships and would proudly display their boutonnieres on their labels showing membership. The successful three Du Ponts, Alfred, Coleman, and Pierre that together took over the gunpowder factories ended up in some serious infighting after a few years. Alfred divorced his wife to marry his cousin, and the Coleman and many of the others did not approve of the marriage. Alfred and the others got Into some serious family infighting. In 1913, Alfred at one point letting his rage get the better of him, got the Delaware legislature to pass a special law changing his first wife’s sons name to spite his first wife. The special law passed the House in four hours secretly at Alfred’s request but failed by two votes in the Senate after the other Du Ponts found out what Alfred was trying. Alfred built his cousin-wife Alicia the most expensive house on the east coast. In 1910 dollars, the lowest estimate is $2 million, but the actual cost may easily have been several times that. The name of the mansion was named Nemours. The main grounds of the Nemours estate are 400 acres enclosed by an 9-ft. wall. Broken glass was embedded in the concrete on top of the wall. Beyond the 400 are 2,000 acres that make up the estate. From 1906 until 1920, the du Pont family broke up into two factions that waged a civil war in various arenas. Alfred I. DuPont led a political campaign that fought the corruption of Coleman DuPont’s forces. Up to that time politics and voting. and vote counting were totally corrupt. By April, 1918 Alfred had defeated Coleman for control of Delaware’s politics. In 1911, Alfred bought the principle daily paper in the area the Wilmington Morning News. In 1916, after successfully blocking his uncle Henry A. duPont from being reelected, Alfred duPont bought control of 9 Delaware newspapers. in 1932, on a trip to Egypt Alfred found a dog be named Mummy that was his familiar spirit. In the biography about Alfred which I read it said, “Alfred had scored over his sister Marguerite. Let her collect Virginia ghosts if she wanted them. Only he had a reincarnated Egyptian mascot who could produce wonders as great as those of Aladdin’s genie.” (Alfred Du Pont by Joseph F. Wail, p. 593) Alfred L du Pont himself wrote this in a letter to the Rev. Baker P. Lee (23 May ‘32) about his familiar spirit, “I have one or two more jobs for Mummy and then I will give her a vacation before I put her to work again.” (He wrote at least one other letter where he talks about the magical powers of his dog. which was his familiar spirit. Mrs. Cazenove Lee, Jr. got a letter mentioning Mummy’s powers too.) Alfred died in 1935. Ed Bali and Jessie Ball du Pont (his widow) took over control of his estate. Ed Bail increased the Alfred I. duPont’s fortune and became the most powerful man in Florida. Ed Bali’s wealth passed the Billion dollar mark in the 50s or 60s. In the late 1960s, political enemies were able to attack the wealth of Ed Ball with new legislation and some investigation of the misuse of his money hidden in the foundations. In 1981, Ed Bail died. in 1985, Ed Ball’s widow claimed that Ed’s sister Jessie had actually murdered Alfred I. duPont in 1935. She claimed that while Ed was alive she had been too afraid to tell the truth about Alfred’s murder. Forbes magazine carried the story in Oct., 1965. T. Coleman duPont, went in business with President Taft’s brother Charles P. (member of the Skull & Bones) in 1910 to build McAlpin Hotel in New York City. (Taft’s other brother Horace was a member of the Order of Skull and Bones. In fact, the Taft family which dates back to Braintree Mass. in 1679, helped start the Skull & Bones Order and at least eight Tafts have been in the Order.) This was the first of a series of luxury hotels. Coleman bought New York Equitable Life Assurance Society, which was America’s largest insurance company. N.Y. Equitable Life Assurance company undoubtedly brought Coleman in touch with other Illuminati elite. He belonged to the Rittenhouse in Philadelphia. He was the director of a number of things including the Union National Bank, in Wilmington and the pres. of Central Coal & Iron Co. along with a few other coal and Iron companies. T. Coleman has been mentioned already in connection to the Du Pont Gunpowder Business, which he ran for a number of years as head honcho. During W.W. 1, the Du Ponts made a mint. The company had $9 million surplus in its treasury. The result was that Du Pont absorbed General Motors. The DuPonts also went Into the chemical business. The American government had seized the German Dye Trust, and the DuPonts were given their patents. The Du Ponts began to build a great chemical empire on the synthetic, such as shatterproof glass, paints, rayon, nylon, dyes, photographic film, rubber, chemicals, drugs, etc. Only the Dow Chemical Company is any competition with the DuPont chemical operation. Alfred Victor duPont (Alfred I.’s son) served only as a private in the marines during W.W. I and was on board several ships. And yet for some reason when W.W. 11 broke out, he was made a consultant to the Joint Chiefs of Staff from 1943 to 1945. He was an Episcopalian. Emile Francis duPont (1898- ) graduated from Yale, like a number of duPonts have. He was important lay person within the Episcopal church. Pierre Samuel duPont belonged to the American Philosophical Society. He also wears the rosette of an Officer de Ia Légion d’ Honneur. (How or why he got this I haven’t found out.) He was on Delaware’s State Board of Education, 1919 – 21 . He was the President of General Motors from 1920-23 when he turned it over to Alfred P. Sloan, Jr. Pierre Samuel started what is called “the buddy system” where DuPont and GM’s management worked together. DuPont saved GM from extinction after W.W.I and has watched over GM since. Robert L duPont, Jr. is a research psychiatrist. He has done research at Harvard. He was the delegate for the US. at United Nations Commission on Narcotic drugs (1973-78). He is especially knowledgeable about what drugs will do to a person, which le an area of his research. And Francis Marguerite du Pont (born 1944 in Duluth, Minn.) is deep into research into genetics. Those of us, who know what these people want to do, cringe when we see that some of the top genetic researchers are connected with Satanic families. Every American almost everyday uses a Du Pont product. When I began learning what the DuPont industries produce it is utterly astonishing. Anything that involves chemicals is under their production. Herbivores and fertilizers for farming. cosmetics and nylons for women, chemicals for all types of industrial production, textiles of all kinds, cleaning fluids such as when you clothes are dry cleaned. The list can go on and on. Most of us are using DuPont products almost continuously all through the day! General Motors, the explosives and gunpowder monopoly, the chemical monopoly (which its tens of thousands of products) gives the duPonts enormous financial leverage. The DuPonts obviously are in close cooperation with the elite involved with oil-because so many of their products are derivatives of petroleum products. In 1940, it was estimated the duPont family was worth $5 billion. Today, their total worth must be many billions of dollars, not to mention the enormous power they wield. The very survival of the United States military is dependent upon the military products of the DuPonts. Although the DuPont companies -the principle DuPont company is E.L. DuPont De Nemours & Co (whose 1991 revenues were $38.7 billion)- are run by many executives who are not duPonts, the duPont family does quietly pull the strings in the background. Many of the executives are men whose philosophy of life matches the duPonts. It is very clear that the DuPont companies are being used in a big way to move us toward the New World Order. The first item on this, concerns how the Du Pont workers are being Indoctrinated. I received a video of the Pecos River Training near Santa Fe, N.M. that DuPont workers in the east are sent to. I also looked at a magazine article about this training (indoctrination) in the article “Go Take A Flying Leap (for the company)” (Successful Meetings June 1992, pp.59-62). A Christian brother who works for the DuPonts in Tennessee has been secretly undermining the efforts of the DuPont company leaders to turn the workers into New Agers. With the help of Christians in the plant, this Christian brother finds out what is planned, and then does his homework so that he can proof to the workers how New Age ideas are being brought in to subvert their thinking. The company changed from calling all its people “employees” to calling them initiates. The people at the plant were to all be sent to the Pecos River Training by DuPont, but due to the exposure of their New Age subversion, people are not allowing themselves to be led by the nose. This brother sent me a video of the Pecos River Training. and there are scenes in it where “strangers” are kissing each other-well, not exactly strangers because the training is designed to break down individuality and to create a group think with intimacy. Initiates are taught ,,don’t slay the ego, ego is your servant.” Another magazine article in (June 1992, p15-16) tells about the five type of thinking that the DuPont company is trying to instill in their people. They are 1. lateral thinking; 2. metaphoric thinking; 3. positive thinking (this is also called visualization-or in the occult witchcraft); 4. association trigger; 5. rapturing and interpreting dreams. An employee environmental awards program was installed where employees can win money by submitting their environmental suggestions. (Personal Journal Aug. ,92, pp 60-71.) Many of the readers of this newsletter are already aware of how the environmental issue is contrived and controlled by the elite. One of the items our new-agy Dept. of Education secretary Alexander tried to get going was for education to shift from the schools to the factories. This is a process that the Illuminati want to implement to further take us into a total slave state. Interestingly, DuPont has been getting into the act by spearheading Delaware’s BRT task force, in which students will attend seminars at Du Pont facilities. The DuPont company is employing A.A.-that is artificial intelligence. The neural networks are to the point they can learn from their mistakes. DuPont is taking us into Brave New World. They were the first ones to initiate with Fax NOW a rapid customer service called fax-on-demand. Du Pont is now in the process of becoming totally global. They already have plants in a number of South American countries, Mexico, Canada, US., Korea, Japan; and several European nations. They have been trying to figure out how to enter the Commonwealth of Independent States (CIS–what used to be USSR). Apparently, they lost some money already in that regards. The ICI (Imperial Chemical Industries- which is allied with the Warburg family) in England and DuPont swapped plants. Imperial Chemical Industries has had their headquarters in Wilmington, Del for some time before this swap. DuPont got ICI nylon plant, and ICI got DuPont acrylic plant in the states. Why? So both companies could become more international. Or in the words of someone else to “focus resources on businesses where each can develop stronger global positions.” (See Economist, 10/3/,92, p.76) The swap will give DuPont 43% of the European market for nylon fibers used to manufacture carpets. The CEO of E.l. du Pont de Nemours & Co. is Edgar Woolard who took over in 1989. Edgar is innovative which will be beneficial in the ’90s with all the upheavals coming. One item that the Illuminati have planned is to put things Into our major cIty water supplies Interestingly, DuPont has research facilities and a Chamber’s Work facility in Deepwater, New Jersey which both deal with water treatment. The du Pont family today i represented at the sixth Illuminati level -the Pilgrim Society. I am convinced their power also run higher, but want more information/research to bring it out to the open. One book said that th du Ponts were one of the top three influential families in the United States today. Now the threads of this story return to Portland. A man who saw my book The Watchtower & The Masons told me 2 years ago that be knew John Lawrence. He said I and John would like to meet, and that be would arrange it. One of the weekly papers here is the Willamette Weekly and they seem to be free of some of the stifling control of the New World Order in contrast to our daily paper The Oregonian. A research writer for the Willamette Weekly using John Lawrence’s research on the Skull & Bones Order wrote a long article in the Willamette Weekly about the Skull & Bones Order. John Lawrence and I would be a natural shoe-in as Mends since we both investigate secret satanic groups. But the man who knew John Lawrence always told me after promising to get us together that John had disappeared. Not only that but this man’s original openness turned to not wanting to have much to do with me. touching some type of very sensitive secret. Here is what I have been able to find out. Several satanic groups are in the Gates, OR area. John Lawrence was extremely interested in what the 322 of the Skull and Bones Society meant. He was convinced that number linked the Skull & Bones society with other groups. John Lawrence and 2 other researchers like himself moved to Mill City to investigate the secret satanic groups in the area. From someone from the inside it turns out that the CIA shot two of those researchers while they were in the Mill City area investigating. The CIA went looking for John Lawrence. And John Lawrence is now in hiding. People in the Mill City area were afraid to answer my questions. However, I was able to glean a little information with a great deal of effort. Some occult group bought a ranch near Gates, OR. The head of the group is Jim Cole. They bought a ranch, which is not in Jim Cole’s name. The last police raid against any occult activity was over five years ago, and it appears that the Satanists are in the key positions in the Mill City and Gates. They may even have a person on the police force. The last obvious item to comment on is that for some reason, the CIA is very mixed up and sensitive about this occult activity. John Lawrence was One reaction to my duPont article was that someone whose mother-in-law works for the duPonts in Pennsylvania asked a few questions and found out that her mother-in-law is an actual witch (I don’t mean as in an old hag–I mean is in witchcraft.) This witch is close friends of the duPonts and has been protected from being fired by the duPonts. What is most significant in this whole thing to me is that my article got other people cognizant of what happening so that they could teach themselves. Once people begin to really catch on to things, they will begin to detect things all around that are happening in regards to the NWO. Most Americans don’t have any frame of reference to hang any facts about the conspiracy. They bemoan the idea of a Satanic conspiracy, they claim there is no proof all the while it is all around them! For instanced, did anyone catch what Bill Clinton did when he faced the people and waved at the inauguration? See the last article in this newsletter for an answer. A friend called my attention to Inside Edition’s television story on Lewis Dupont Smith, the heir to the $10 million fortune of the Du Pont Chemical Co. Lewis Dupont Smith is exposing his family. Of course on national television, which is controlled by the Illuminati they are not going to do much exposing-but they did let a few hints get through. Lewis Dupont Smith did get a sentence left in what was shown on TV. where he points the finger it “powerful families” as the culprits behind the drug trade. The reason be was allowed to voice this, was that Lewis was the person behind the book Dope, Inc. and it was this involvement that got him in hot trouble with his family. Lyndon LaRouche, who was truly exposing the Satanic conspiracy, wrote a good book Dope, Inc. The book exposes the Queen of England is a participant in the drug trade. Yes, the British royal family does tie in the elite, the occult, and the drug trade. They are not as nice is their pictures suggest. Lewis Dupont Smith, having a good feel for what is going on, recognized that Dope, Inc. is the as be put it (paraphrased) “The only book showing the involvement of powerful families.” Lewis provided the $212,000 for the book to be printed. (Good for him!) Let’s just make it plain, the Satanic hierarchy is behind the drug problem. Lewis’ family was very upset that he was helping the enemy, and they got a judge to rule that Lewis was incompetent to handle his financial affairs, and the court declared that Lewis can have on $15,000 per/? of his fortune. The duPonts also tried to stop his wedding. A federal informant saved Lewis from getting captured, and taken 60 miles into the Atlantic on his father’s yacht to be tortured and programmed. His family had hired a motorcycle gang with black hoods and some CIA-Green Beret types to kidnap Lewis. Lewis managed to get wind of the scheme and save himself. He tried to get his family on conspiracy to kidnap, but the duPont family bear in mind as one of the top 13 Illuminati families owns justice in this country. He failed to get his family on the conspiracy charge. One detail, that I didn’t mention in the original story on the duPonts was the one of the more recent Governors of Delaware C. Douglas Buck was married to Alice H. duPont. I also left out a great deal of the inside story on the politicking that has gone on in Delaware this century. It is so detailed with so many names that I didn’t want to confuse people with it. Anyway, the bottom line is that behind the scenes, all of the Governors since the 1920s have been approved by the duPonts. I debated whether to include the du Ponts genealogy. I had it, so I decided to give it, on the chance someone might use it. The genealogy shows several things, a. that the duPonts like the Astors repeatedly used the same names over and over, b, that the duPonts like the Rothschild’s had a lot of first cousin marriages (marriages between a du Pont and a du Pont are given asterisks-however some of the marriages between people with different last names are also between first cousins and other relation. If it looks like I’ve gone to a great deal of trouble for nothing-I can understand what you’re saying. We certainly don’t need to know every du Pont. But just like in a laboratory one deals with many exact small details in numerous experiments to discover a principle-that is what I am doing here. I am trying to break ground so that people will understand more about how the elite think, etc. I had hoped that I might also be able to track which branches are with the Illuminati and which may have balled out.